If you have landed on this page looking for The Chicken Coop Manual, please click here to jump to that page. When we first started with our birds, chicken coop plans were as rare as hens' teeth. Each poultry book we purchased had perhaps one or two plans listed within, as if those few plans would cover every possible set of conditions which flock owners might face. Sadly, that was not the case. Fast forward to the current time when small flock ownership is enjoying quite a revival. Urban chickens and local foods are once again in great demand. As a result, unprecedented numbers of folks in cities, towns and rural settings, are asking the fundamental question - how do we provide cost-effective, practical, safe and attractive housing for small flocks? Happily, flock owners now have access to a tremendous variety of chicken coop plans. Some of these plans are free, and some of them require purchase. All of them have been built at least once, sometimes hundreds or thousands of times. To be sure, not all of them are suitable for every possible flock. If anything, the increasing numbers of small flocks has only driven the need for a huge variety of chicken coop options. We don't claim to have every possible design here, but we'll try to provide a very good sampling. By viewing all these options, it is our hope that flock owners will be able to find some valuable ideas for solutions appropriate to their particular circumstances, even if they don't find the exact plan. If flock owners do find the exact plans they want, so much the better. The Internet abounds with free chicken coop plans, but some plans are better than others. By that we don't mean in terms of appearance or size - those variables need to be chosen by each individual flock owner. Instead, we mean the reliability of the plans as a blueprint for building something. Are the measurements correct? Are all the structural pieces listed and illustrated to scale, such that the drawings can be used to generate a materials list? We also mean plans which result in a structurally sound building. Are the rafters strong enough to hold up the roof? Will the sides cave in with the slightest wind? Will the building sag or lean over time? Sadly, some so-called "plans" offer no measurements or incorrect measurements, they call for woefully inadequate structural supports, or they are otherwise unsuitable as blueprints. We will say right here that we are not professional engineers; it is not our task to evaluate whether each plan is suitable for a particular environment or set of conditions. Rather, we have chosen sources of plans which were developed specifically to provide solid, cost-effective, practical, and durable housing for poultry in either household or small commercial flocks. We offer a variety of those plans below. To the best of our knowledge, each set of plans below offers correct measurements and sometimes even material lists. 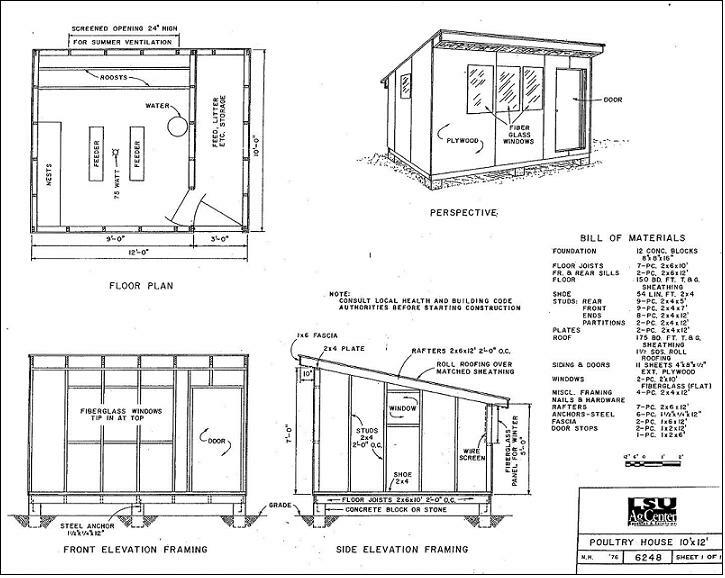 The plans range in size from a small hutch-type coop suitable for a half-dozen birds, up to field structures suitable for small commercial flocks. We have set an upper size limit of 100 birds; beyond that size a business will need to develop their own plans based on their particular circumstances. All these plans have been proofed over the years by a variety of poultry and livestock housing professionals. We share them here in the hopes that flock owners in search of a good chicken coop, will find what they need. LSU AgCenter provides numerous plans as free PDF downloads, for coops ranging in size from a small raised hutch for 8-16 birds, all the way up to layer hen housing for 100 birds. These plans were developed by various university and Extension Service personnel over the years, and they each have various features which may be appropriate for certain settings. For instance, some of them offer solid flooring and insulation, while others are light and airy for warm climates. A very good spectrum of plans. This page also provides a variety of plans for poultry equipment, for instance feeders, brooders, roosts, etc. Virginia Tech and the Virginia Cooperative Extension Service offers a very nice 9-page PDF entitled Small Scale Poultry Housing, available for free download. This PDF not only offers several coop designs but also provides additional information about coop design criteria. Very highly recommended for that additional information alone, even if the plans themselves aren't quite what a flock owner is looking for. The Canadian Plan Service is a government agency which provides livestock plans for farmers and ranchers, including chicken coops. These plans are categorized by layer or broiler operations, and then by flock size. The Chicken Coop Project offers a very basic, permanent coop for up to 10 heavy layer birds. While this is only one plan, it is very complete with measurements, photos, several views and additional information from the builder. The plans themselves are available as a free PDF download. A good candidate set of plans for a flock owner's first coop. We also wanted to offer several very good sources of information for all things related to small-scale poultry ownership, particularly backyard and family-scale flocks. The following sources have a variety of coop plans, but they must often be purchased for a small fee. Nevertheless, a prospective chicken coop builder can "window shop" for a tremendous variety of plans at these websites, and perhaps find exactly what they are looking for. BackyardChickens.com has become one of the top sources of information for family-scale flocks. Their website has a tremendous amount of information, including a forum where members can converse about a wide variety of poultry topics. Their Chicken Coop Plans section has literally hundreds of coop plans. Many of them require purchase prior to download, but the fees are usually small. Buyer beware - these plans are the creation of the coop builder, rather than any sort of professional or academic institution. No warranties made about how accurate the plans will be, and/or how practical or durable the coops will be. eFowl.com is a plans and equipment supplier for all types of poultry, including waterfowl, turkeys, and guinea hens. They offer plans for sale at what seem to be relatively steep prices, but those plans come with free Customer Service during construction (for instance, if the instructions aren't clear) and a money back guarantee. For those who are less than confident in their building skills, that might be nice insurance. The Chicken Coop Manual: On Sale! Online plans won't give you any of those answers. Thankfully, we have a solution: The Chicken Coop Manual. When we published The Chicken Coop Manual in early 2014, our goal was to get proven, cost-effective how-to information into the hands of as many chicken flock owners as possible. We have worked with enough new poultry flock owners to understand the questions they have, the challenges they face and the goals they aspire to reach. We wrote The Chicken Coop Manual specifically for them. We cover 20 different coop designs, including their advantages, their strengths, their disadvantages and their weaknesses. But that's only the beginning. We also provide information about all the above topics (and more) so that poultry flock owners, regardless of location or size of flock, would be able to make educated decisions about which coop would best fill their needs. We wrote the book as if we were visiting with you, talking with you over the kitchen table, evaluating your particular situation, your challenges, your concerns, and your goals. We can purchase the book wholesale since we wrote it, and we want to make the book available at a price much lower than Amazon's retail price. If you are interested in buying print copies of The Chicken Coop Manual directly from us, Contact Us and we'll ship it out to you for a flat rate of $18.00 each. If you are a teacher or workshop host, entrusted with teaching new poultry owners, let us know. We may be able to lower that price even more for bulk orders. Contact Us for large orders and we'll work with you on bulk rates depending on your situation. Used copies of our book are also usually available on Amazon.com. Simply go to the listing, then click either the Used or New links showing immediately below the Paperback version. A number of sellers offer the book in various conditions (Like New, Used-Very Good, Used-Good, Used-Acceptable), for various prices, all of which will be cheaper than Amazon's list price. If you don't need a print copy, and simply want the electronic copy, we also offer the book in Kindle form through Amazon.com. The usual price is $9.99 with occasional promotions for as low as $6.99. If that's still too expensive, we offer the entire book, with all the illustrations and references and photos, in a PDF version available as an immediate download for $4.99. We want to make sure that anyone who wants more than just the plans for a building, will be able to get that information in the most affordable, most convenient format possible. As always, thanks for your business, and please feel free to Contact Us if you have any additional questions. The list of websites and organizations who offer plans, free or otherwise, is constantly expanding. As we become aware of additional resources, we'll share them above. If readers already know of such sources, please contact us with that information and we'll be happy to share it.